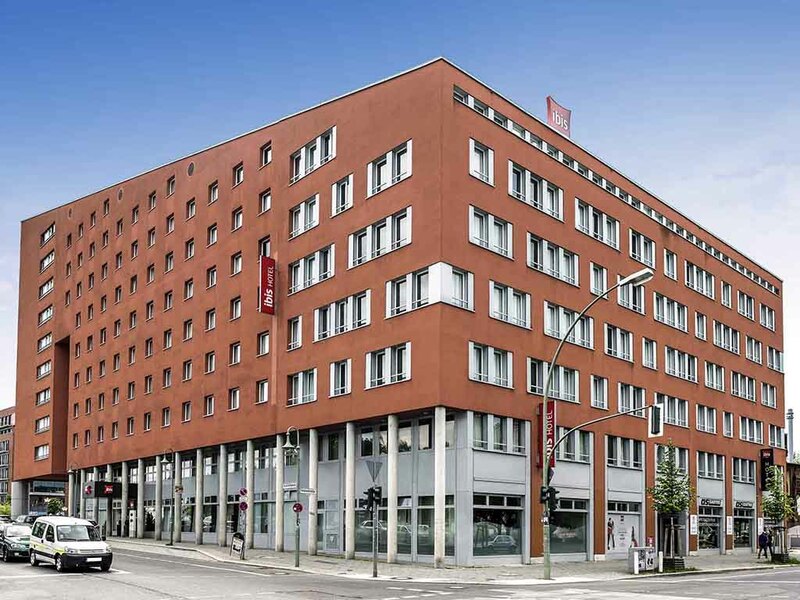 Hotel ibis Berlin Ostbahnhof. Book your hotel in Berlin now! You have the River Spree on your doorstep, the Ostbahnhof and Mercedes Benz Arena are just a short walk away and you can reach Alexanderplatz or Friedrichstraße in a few minutes with the S-Bahn: The ibis Berlin Ostbahnhof is perfectly located for visitors to Berlin who want to get around the city quickly. Our modern hotel has 242 air-conditioned and cozy rooms, free WIFI access and super comfortable, innovative beds. You can leave your car in the hotel's indoor car park. Your restful night's sleep is important to us! All 242 rooms are soundproofed, air conditioned and have Sweet Bed by ibis beds for the ultimate in sleeping comfort. A TV with a wide range of Sky channels will keep you entertained. Have fun! Superior Room with a double bed (63 in x 79 in) and view of the River Spree. Even among the nightlife spots of Berlin, only a few places stay open as long as our 24-hour bar: We serve snacks, crispy paninis, drinks and refreshments around the clock. Now with live sporting events on Sky! Perfectly situated, wonderful view on the radio tower. We enjoyed our stay. The hotel is perfectly situated and we enjoyed the wonderful view on the radio tower. We took the breakfast one day and it was really good, lot of choices and fresh minute-made waffles! The only negative point would be the decoration in the room (looks a bit old). However the bed was confortable and we enjoyed quite nights. I recommand ! it was a lovely 3-night stay at ibis Berlin Ostbahnhof. Very small room, but clean. Good breakfast, friendly and helpful employees. Overall good stay. The hotel is located conveniently near a main train station, so from there you can reach anywhere in Berlin; plus, the staff is really cool and helpful, the breakfast is very good for the price and the rooms are the best Ibis offer - clean, reasonable space and very easy to use. quite near is the largest section of the Berlin wall still standing and also the famous Kreuzberg. Comfortable room, friendly and helpful staff, convenient location and good value for money. The hotel was in exactly the right location, just opposite the station, as I had just come from the airport and was taking a train the next day. Booking, checking in and checking out were quick and easy and the staff at reception were very friendly and welcoming. The room and bed were comfortable. I didn’t use any other services as I arrived late at night and left the next morning. Value for money, I enjoy the Ibis brand, however the daytime staff was not the friendliest. This was unlike our previous experiences. I am a frequent worldwide traveler and after a long time I visited again an IBIS Hotel. This was the first time I was given a hotel room in which the TV was not in operation. Other than that the room was okay. Breakfast was very good. It went smooth and we had a quiet room. We enjoyed our room. The only thing we missed was a watercooker. Where to start... asked for a room away from the lifts not done! Had to change room to only find out that the room has no working air conditioner so had to move room again to find that this room had two single beds so ended up sleeping in bed separate. The staff did not seem to care at all. One staff member in particular was so rude to me one night at the bar he actually shouted at me because I told him not to be so rude with how he was talking to me. Not happy at all I will never stay in another one of your hotels again I will not be spoken to like that ever by anyone, absolutely not customer service whatsoever I’m absolutely appalled by his behaviour and the lack of care from the staff. This was the first time I had stayed in the former East Berlin, and it offers a diffrerent perspective to this great city. The views over the river Spree are delightful, and it is so close to Ostbahnhof for the S-Bahn. Breakfasts were great. The staff were efficient and helpful, and gave good advice when a train strike was likely to be problematic for my journey home. Luckily, I managed my &quot;Escape from Berlin&quot; by train with relative ease, and would like to thank the staff for the assistance in understanding the local news. once again, location is everything for me. one hundred meters or so for Trains, S Bahn and other transportation. As a Platinum member of Le Club Accor Hotels, I was treated very well and enjoyed all the hospitality. Very happy, will always come back! This was my 4th time staying at the Ostbahnhof Ibis hotel in Berlin. The hotel is clean, the staff are friendly and the rooms are comfortable. It is by no means luxury, but for a city break it serves as the perfect base to rest your head before another busy day of galavanting! As I say I come every year for the Berlin Christmas markets and will continue to use Ibis Ostbahnhof! Thanks guys!